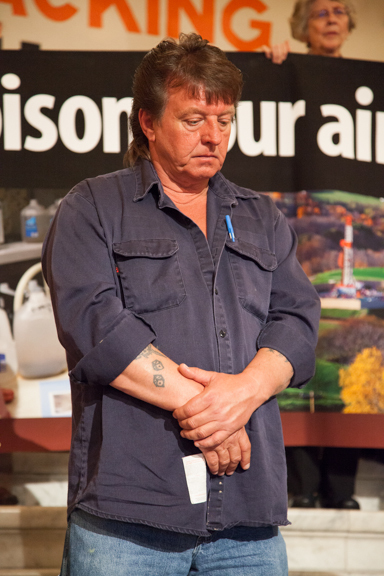 Talking about lesions the size of pancakes on his former co-worker’s side, Rick “Mac” Sawyer stood in the Capitol Rotunda making a case for state leaders to listen to more than 100,000 people’s calls for putting the brakes on drilling for natural gas in Pennsylvania. The former drilling rig worker said he too is sick. Neither he nor his friend [Randy Moyer] has insurance and neither knows exactly what is wrong with them… Sawyer blames the ailments he and his friend suffer on a lack of proper training and protection provided when it came to the risks associated with handling water used in hydraulic fracturing, or fracking, a process used to extract natural gas from Marcellus shale. Sen. Jim Ferlo, D-Allegheny County, said he plans to introduce legislation to bring a halt to fracking until a thorough study of its environmental effects is done. He called on his House and Senate colleagues to join him in supporting the measure. 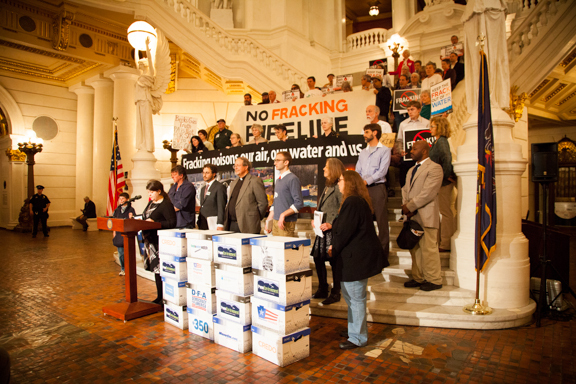 Pipelines, compressor stations, flaring, flowback waste pits, radioactive drill cuttings and other toxic aspects of shale gas development each took a hit at the historic April 30th press conference in the Capitol Rotunda. ← Earth Day Actions at DEP Offices: Six Actions at Six Locations Statewide! I cannot see the photos. Sounds like a great action. On International Workers Day lets call for an end to chewing up workers for the profit of the natural gas industry. Fixed: All can see the photos now. Touche for that on May Day and every day. This industry’s treatment of workers, as well as residents, is a human rights issue. Randy Moyer’s suffering is especially terrible, but unfortunately he is not alone: Mac and Randy say that about half of the workers they know have symptoms. Mac’s girlfriend, Lisa, and all three of his sons, Ricky, Matthew, and Sonny, were affected by skin rashes from contact with their father when he came home from work — can you imagine putting your family at risk just by washing your work clothes with their clothes? That’s the reality in shale country. My comment is to put Corbett in prison for selling out the air, water, land and people of Pennsylvania, to prop himself up for this equally criminal industry. Same goes for Michael Krancer, the lying criminal former DEP Secretary. 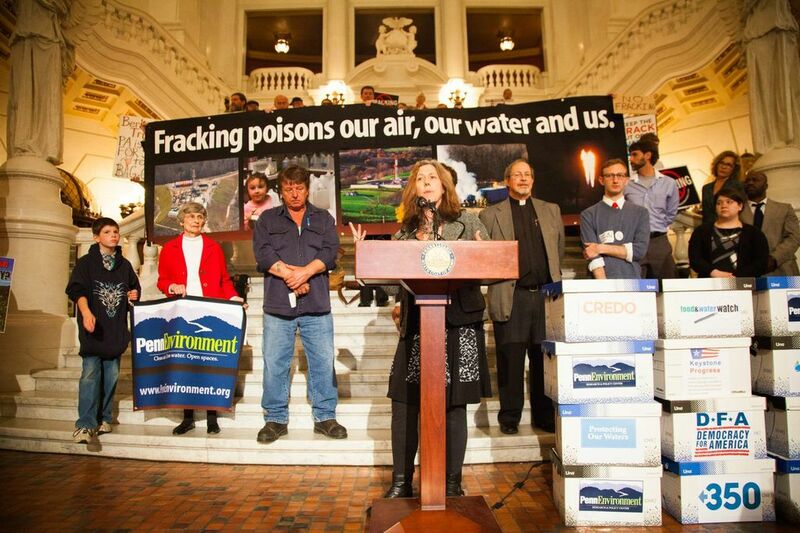 Later this morning in Harrisburg, May 2nd, 10-12 panel discussion on public health risks in fracking in Pennsylvania-sponsored by Greg Vitali. Minority Caucus Room 418 Main Capitol Bldg. After all those petitions, 100,000, a caring governor needs to attend today. Maybe we need to knock on his door and walk him over? or call him tomorrow and ask if he attended? Great idea, Tam. I called, received a disinterested response, was told “I’ll be sure to forward the information over” and was told that all the high-level staffers are in a meeting so the phone call could not go up the chain. It was clear that I was the first call on this today, so it’s a good idea for others to call: 717-787-2500. Thank you Iris and Karen and all who have continued to press this issue. Your perseverance, compassion and quest for justice are so inspiring! Anyone interested to know just how much oil and gas money has gone into PA politicians pockets can look at http://www.marcellusmoney.org for the details. It includes the politicians names, what company gave how much money, and even the date the money was given. It’s astounding info !!! PA’s politicians should be ashamed that they sold out the state’s people, water, land, air, and the resident’s way of life !!!!!!! !